Brent's Travels: Do They Need The Money? I often give people in financial need 1 to 5 dollars. I try to keep a one dollar bill rolled up in my pocket for when the situation arises so I don't have to take out my wallet in front of those in need. Conversations with my two sons often comes around to "How do you know they are truly in need?" At this point of my life, I don't care if people are "truly in need" when giving a dollar or two. In college, I loved sociology and during my life I have tried to take time to understand people, including those that may not have been particularly nice to me. On Tuesday this week I went down to the "Old Fisherman's Warf" here in Monterey to take some pictures and do some people watching. 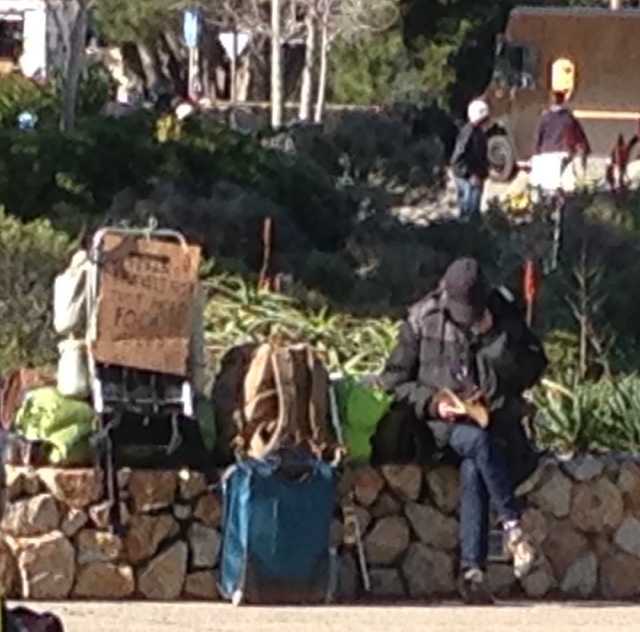 I ran across the woman sitting on the stone wall next to these two backpacks and blue roller suitcase to her right, with a hand written cardboard sign to the backpack furthest from the woman. On the way to the wharf, I passed close to her and the guy playing guitar across from her and read the sign that says they are veterans needing financial help. I didn't stop on my way past them. I made note of only a few tourists, unlike weekends when it gets crowded. I didn't expect they would get much money today. This left me with the impression that they are really hard up or didn't know when to look for money. My walk back brought me the same way and I had gotten a dollar out to give her with the intension of entering into a conversation to understand their story. I walked up to her and handed her a dollar and and she politely accepted it. I followed up by asking her where they were heading. She looked in late 40'/early 50's and like she had been living on the road with backpack for some time. She responded that they were headed to Costa Rica. 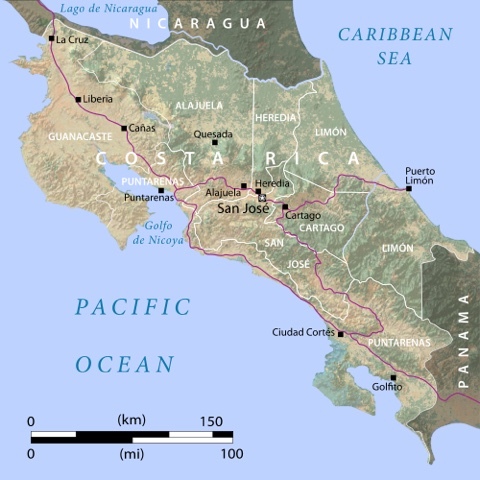 Further she stated that she suffered from arthritis and needs the consistent warmth that the Costa Rica climate offers. I then looked to her left (not visible in photo) and there were two small dogs. One sleeping and the other drinking water from a bowel. There was no way for me to evaluate the extent of need for money they had, other than firsthand appearance. In this case it appeared all of their worldly possessions were in their backpacks and one blue suitcase other than the dogs. It is curious that people in financial need often have animals and the animals appear to be taken care of. I've never given money to someone then and worried about how it is spent. I finished the conversation wishing them luck in their travels. On the way to my car I walked past about six homeless people, where the Monterey community has a weekly dinner for them, near the beach. 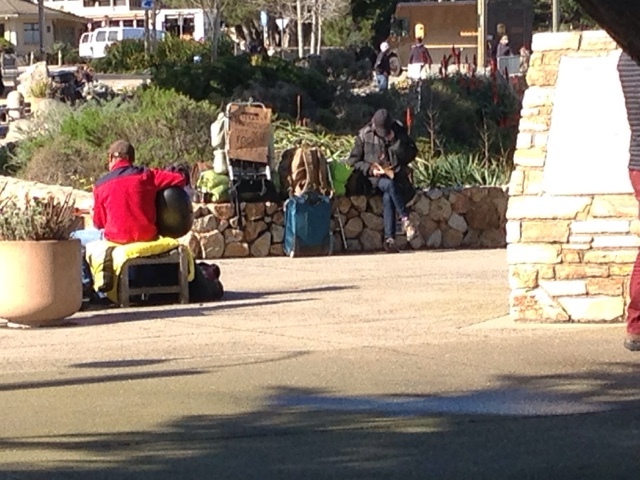 There was one woman with a bicycle and a suitcase opened on the concrete picnic table putting her clothes away. None of these people were asking for money, but I felt bad for the woman trying to keep her clothing orderly while being homeless. It had rained heavily all morning and I wondered how she kept her clothes dry or had the clothing gotten wet and she had dried them. In a way, I felt she was more deserving of my dollar than the two going to Costa Rica, but I'm not here to judge and made my way to my car, knowing that my travels will provide more opportunities in the future to pass out a dollar here and there.